So for some reason this year we can't get a single zucchini to grow in our garden. They get to be about 3-4 inches long, and then shrivel and die. It's quite disheartening, as you can imagine. The one thing we're doing really well on, though, is jalapeño peppers. I gather about 20 of them per week, and we have them coming out of our ears. We found a great way to use them last week in this pizza! It really wasn't anything all that different from what I've made before, but the addition of fresh jalapeños really jazzed up the turkey pepperoni and turkey sausage. I used (as always) my favorite pizza and sauce recipes (listed below) and made a cheese pizza for the kiddos as well. It really doesn't matter how often I make this pizza... we still love it! Viva la pizza night! Preheat oven (with baking stone) to 500. Mix together water, yeast, sugar, and salt, then add flour. Knead until smooth. Let dough rest 10-15 minutes, then roll out into two crusts. I usually shape my crusts on the preheated pizza stone (sprinkled with cornmeal) or on a sheet of parchment paper. 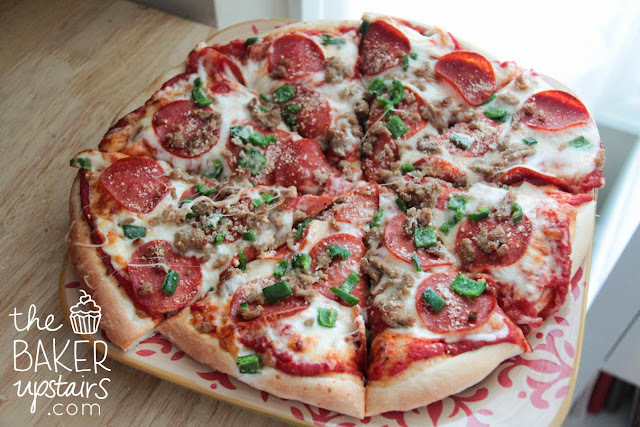 Add desired toppings, then bake on pizza stone for 8-9 minutes. Combine all ingredients in food processor or blender and blend until desired consistency.